Earlier this month we attended Railtex 2017 at the NEC in Birmingham. This was our 5th time exhibiting at this show. We find it very interesting as it is a Rail only show. It’s great to meet new and existing customers at such targeted exhibition. As it is a bi-annual show we feel that the visitors are very enthusiastic and everyone makes a real effort to attend. We found that our stand was fairly quiet on the first morning of the show, this is to be expected, it got busier by the afternoon and we were receiving plenty of visitors and enquiries, this continued for the remainder of the show. 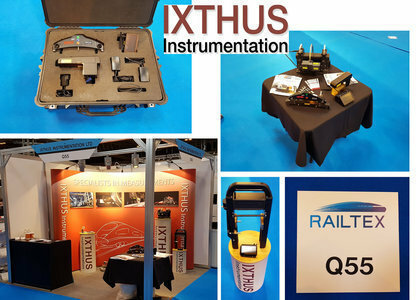 The Riftek Rail Measuring Gauges which we had on our stand were of particular interest at Railtex. These are available from Ixthus within the UK. These three products were popular at the show. The IKP-5 Series is a laser.profilometer for measuring the parameters of the rail wheel flange; the thickness, the slope and the height can all be measured with this device. The PRP series is also a laser profilometer, this series is designed for non-contact registration of cross-section of the rail head acting face. Tony and Michel are our Ixthus salesmen, they were both on the stand for the whole show and enjoyed the experience. We are already looking forward to Railtex 2019 – will we see you there?